ProM 6.7 is a release targeted at researchers. Researchers should be able to refer to this release knowing that it will not change, as any change may invalidate obtained (and published) results. If you do not need to publish any results, please consider to install the latest end-user release (ProM Lite 1.2). This end-user release contains less functionality (it will not contain the latest research prototypes that ProM 6.7 does contain), but does come with updates. On October 13, 2017, the XES Working Group has certified ProM 6.7 for the levels A-D and X, for both import and export. This means that ProM 6.7 correctly imports and exports any XES file. 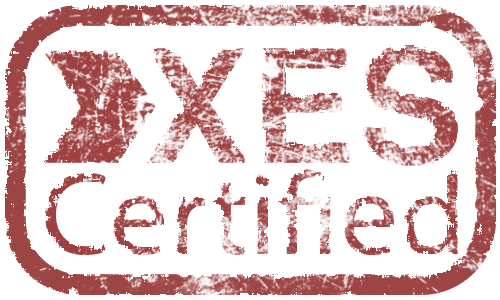 This makes ProM 6.7 the first tool that receives a XES Certification. The downloads as mentioned above only contain the ProM 6.7 framework. They do not contain the ProM 6.7 packages that contain the vast majority of the plug-ins. Once the ProM 6.7 framework has been download (and installed), the packages can be installed through the ProM 6.7 Package Manager. Start ProM 6.7 Package Manager. On Windows, you can do this by double-clicking the ProMPM67.bat file in the folder where you have installed ProM 6.7. On Linux and Mac OS X, you can do this by starting a shell or terminal, going to the folder where you have unpacked the archive, and by running the ProMPM67.sh file. On Mac OS X, please do not double click the ProMPM67.sh file, as this starts Xcode to edit the file instead of running it. Optional: Select the amount of memory ProM 6.7 may use in the bar at the bottom. 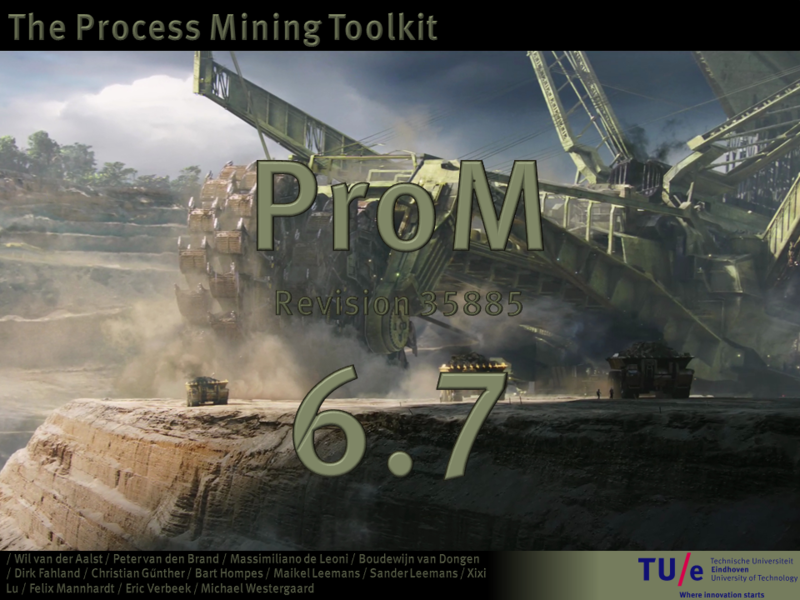 Stop ProM 6.7 Package Manager. Now all packages have been installed, and now we can start ProM 6.7 for the first time, that is, we can start the maiden run of ProM 6.7. This is a critical step in the installation procedure, as ProM 6.7 will now build a cache of all plug-ins that if finds in any of the packages that have been installed, which takes some time. Please be patient. On Windows, you can do this by double-clicking the ProM67.bat file in the folder where you have installed ProM 6.7. On Windows, you could also do this through the Start Menu. However, as the maiden run of ProM 6.7 is really critical, we advice against it, and propose to start it using the ProM67.bat file. On Linux and Mac OS X, you can do this by starting a shell or terminal, going to the folder where you have unpacked the archive, and by running the ProM67.sh file. On Mac OS X, please do not double click the Prom67.sh file, as this starts Xcode to edit the file instead of running it. Stop ProM 6.7. Although not strictly necessary, this is good to do as building the cache has consumed resources that will remain claimed during the maiden run of ProM 6.7. It is really better to start ProM 6.7 again after having done the maiden run. The brave and impatient may decide to skip this procedure and to just start ProM 6.7, which will start the ProM 6.7 Package Manager to download and install packages etc. However, as the maiden run of ProM 6.7 is critical, we advice against it, and propose to follow the procedure as mentioned above. Later on, you may decide to add some extra packages to the set of installed packages, or to remove some. To do so, simply start the ProM 6.7 Package Manager, install and/or remove packages, and stop the ProM 6.7 Package Manager. The following start of ProM 6.7 should show the plug-ins contained in the newly installed packages, or should not show those in the removed packages. Users that have installed ProM 6.7 prior to that date are encouraged to update these packages to these versions using the Package Manager of ProM 6.7.